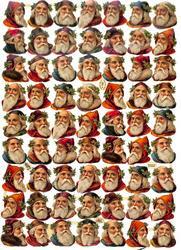 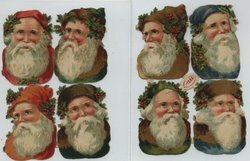 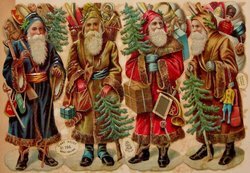 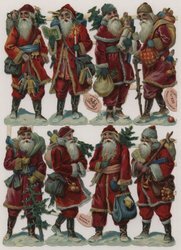 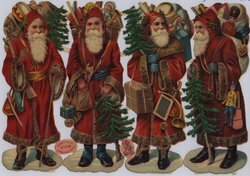 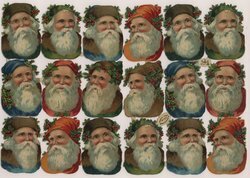 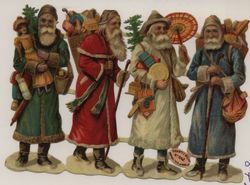 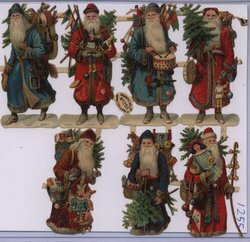 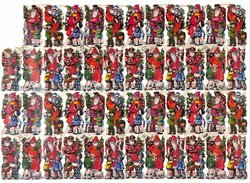 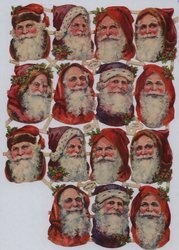 four different Santa figures. 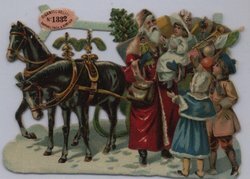 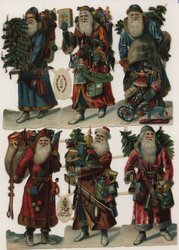 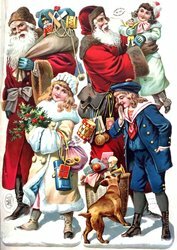 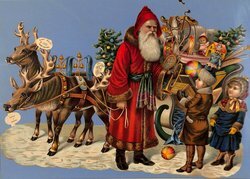 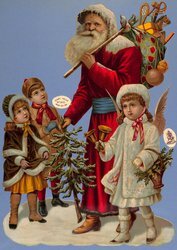 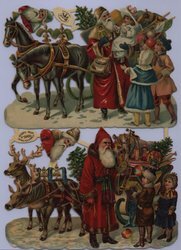 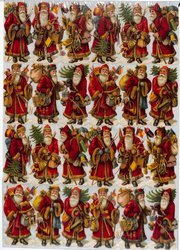 Each wears a different colored, ankle length robe with matching hood and each carries a large sack of Victorian Toys on his back as well as additional gifts and a Christmas Tree in his hands. 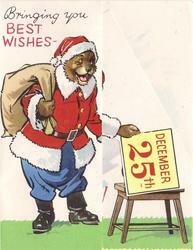 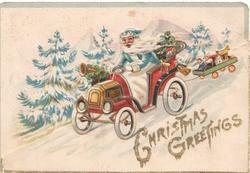 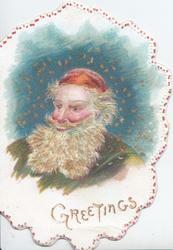 inside right: BEST WISHES FOR A VERY JOLLY TIME! 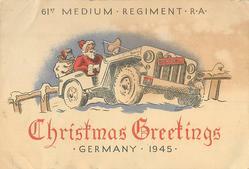 customized inscription inside right: MAY THIS BE THE HAPPIEST CHRISTMAS YOU EVER HAD! 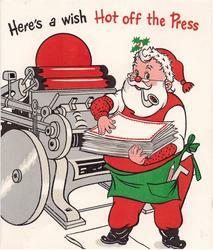 inside: HERE'S WISHING WHAT YOU WANT THE MOST WILL SURE BE IN THE BAG! 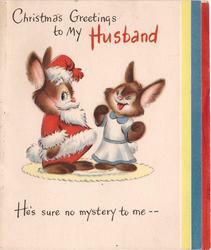 inside right: THIS COMES TO SAY, "YOU'RE SURE O.K.!" 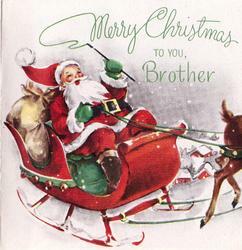 AND COMES TO TELL YOU, TOO, IT'S ONLY LUCKY FOLKS WHO HAVE A BROTHER JUST LIKE YOU! 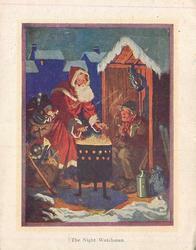 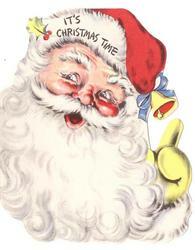 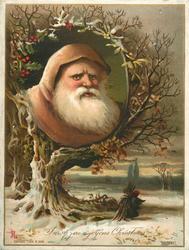 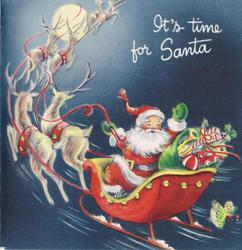 inside right: CHRISTMAS IS COMING AND SANTA IS, TOO, SURE HOPE THAT THE DAY WILL BE HAPPY FOR YOU. 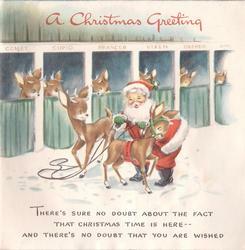 inside right: A LOAD OF GOOD CHEER! 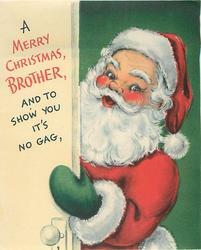 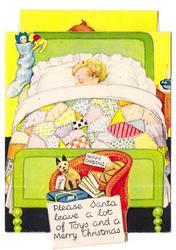 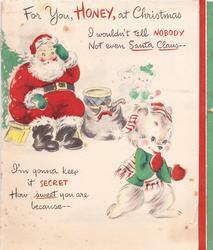 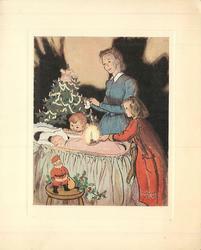 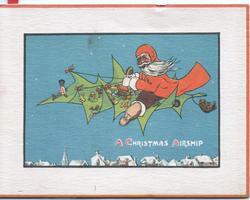 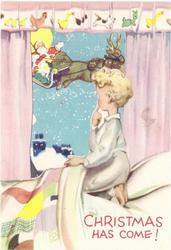 inside bottom: A LITTLE "MERRY CHRISTMAS" WISH COMING JUST TO SAY, "SURE DO HOPE MY MUMMIE HAS A MERRY CHRISTMAS DAY!" 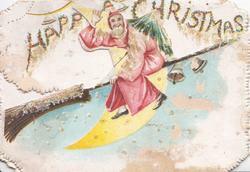 right:-DOZENS OF CARDS, HURRAH! 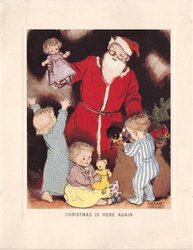 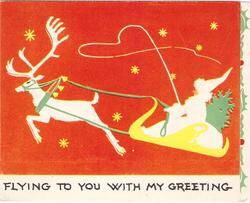 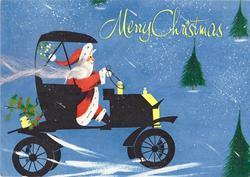 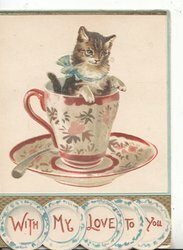 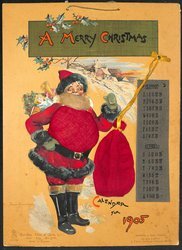 CHRISTMAS IS HERE, BRINGING KIND GREETINGS FROM FAR AND FROM NEAR; A RIGHT HAPPY CHRISTMAS - THIS CARD COMES TO SAY AND A HAPPY NEW YEAR, TO COME AFTER TO-DAY! 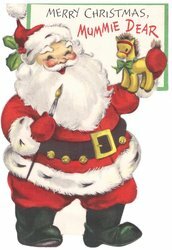 below:-MAY CHRISTMAS BE MERRY AND BRIGHT, THE DAY ABOVE DAYS THAT YOU LOVE, BRIMM'D OVER WITH EVERY DELIGHT, BEYOND ALL YOUR HOPES MAY IT PROVE.